Last day with whole group and a 4 hour drive to the Mekong delta.stopped off at the nicest service station ever been to with lotus flowers open hardwood cabins and hammocks. 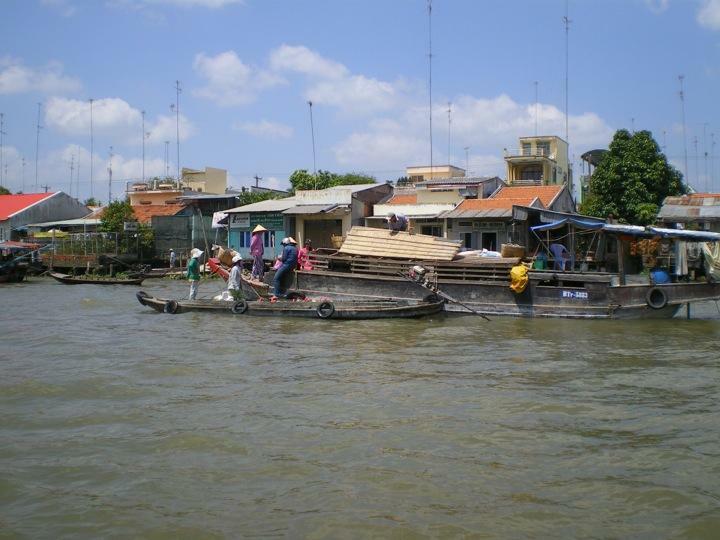 Transfer to boats for trip on the river and into the works of the people who live on this vast river. Past the floating villages and wholesale markets trading in fruit and vegetables , each boat flying their wares from a pole - onions, mangoes, tomatoes, coconuts. Floating demonstrations of making sweet rice cakes, candied ginger, snake firewater and of course the usual to buy. Lunch in a farmers house with the presentation fish and then a sampan ride before one part of the group went back to Saigon and we continued to another fabulous hotel for the night.